Something straight out of a MC Esher painting, and now you can play Risk on it! Hope you like it, I spent 13+ hours straight working on this. Review by Brotherdan on 7/11/2016. It is clear that a lot of effort was put in this map. 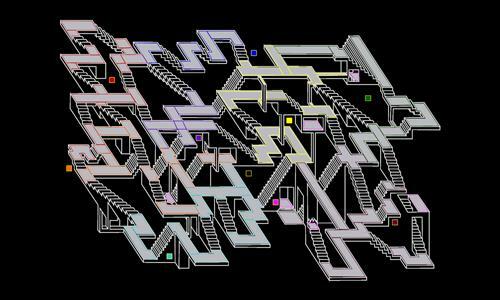 I like Escher and the idea of making a map inspired on his drawings. However, I think you have overdone it a bit, making the map too large and/or overcomplicated. It is hard sometimes to foresee what is connected to what. i.e., I would have expected that 'valley' be connected to 'sacrificial altar', while I would not have imagined 'the temple of syrinx' to be connected to 'king's road'. Neither I understand the left-to-right connection of 'mountain pass' with 'worm hole straight'. The bonuses would benefit from a rebalancing, IMHO. Example: 'mountains' has 9 territories and 4 border territories and is worth 3, 'pyrimid' has just 8 territories, only three borders, and is worth 5. In summary, it is a very nice idea to work on, with no techical problems, but fundamentally unplayable due to the overcomplicated and counterintuitive layout. Making a smaller and simplified version of it might give better results. Thanks for the input, I released a new version of this map, with some fixes. I rebalanced the bonuses and made the connections make more sense. I had made it so that the ones with pillars connecting them were considered paths. I don't know what I was thinking with the connection that does a cross map, I was tired and at the end a 14 hour working streak, so I fixed that as well. Review by NinjaNic on 7/17/2016. So trippy! What a cool map! Review by The Supreme Mugwump on 8/29/2016. Looks nice but nice graphic is too visible and drisracting. Works as an image, fails as a warlight level. So wjile I agree with "So trippy!" comment by NinjaNic, my reaction is not "What a cool map!". I get this artistically, but when i look at a map, artistry can only account for so much, Personally, I prefer a map that is bigger, but this did make you think because not all bonuses where next door to each other.